I am writing today to give you an update on our recent Advancement initiatives. This fall, the University publicly launched Together, the most ambitious fundraising campaign in UW history. The School of Nursing has already raised $25.6 million of our $40 million campaign goal. We also conducted a university-wide search for a new Assistant Dean of Advancement. We recently made the decision to collaborate with Ostara Group, a Seattle-based firm that provides consulting on fundraising strategy and tactics as well as advancement training, with the intent of aligning our fundraising and relationship development goals with our current Advancement initiatives. This decision was made with the input of UW central Advancement, which will underwrite 60% of the cost. Scott Sadler and Kyle Halmrast, two senior Ostara Group strategists, will be working with the school to assist in developing these areas. 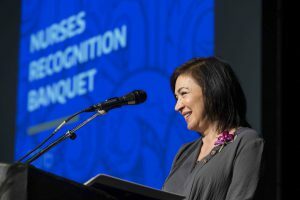 We were fortunate to have worked with other members of the Ostara Group last year in connection with our Nurses Recognition Banquet. With their help, we were able to incorporate our first-ever philanthropic ask during the program without compromising the integrity of our signature event or detracting from the primary aim of celebrating the remarkable contributions of nurses in our community. With the gifts made at the banquet, we were able to establish an endowment benefitting UW Nurse Camp, ensuring sustainability for this important program. We hope to incorporate similar strategies over time for a more robust fundraising effort and results. While Ostara Group is assisting in reworking our advancement strategy, we are reopening the search for an Assistant Dean of Advancement and expanding to a national focus. Finding a candidate with a highly successful record of fundraising and relationship development skills remains our top priority. As you know, Caroline Rosevear has graciously acted as interim Chief Advancement Officer over the last seven months. Caroline will resume her position as Major Gifts Officer effective Wednesday, March 1. We are grateful for her leadership and efforts during this transition period. During the transition, all fundraising events (including the Nurses Recognition Banquet) will continue as planned, with each event moving us closer to our $40 million campaign fundraising goal. We hope to be back in touch very soon with another update. In the meantime, if you have any questions please do not hesitate to reach out to Jennifer Thompson, chief operating officer, at thomjenn@uw.edu or Staishy Bostick Siem, director of marketing and communications, at sbsiem@uw.edu. Thank you for your support during this strategic transition.